Blues is My Middle Name: Where are the jobs? I wouldn't like to be living in Nottingham today and looking to find work. Yesterday, the Nottingham Post ran an article on unemployment in the City, which to put it mildly was depressing. This is at a time when the Coalition Government seem determined to demonise the unemployed, using the mantra, "Off benefits and into work". There are threats to peoples' benefits if they don't get a job. But, where are the jobs? I was fortunate to have started work in a different age. In the 1960's I moved to Birmingham without having a job first - can you imagine doing that now? I went to the Labour Exchange (forerunner of the Job Centre Plus) the day after moving, and a week later I'd started work. I was told of two vacancies and asked which one I wanted. There was no interview; I was just told when and where to start work. Halcyon days indeed. But what of now? Professor Bruce Stafford of the University of Nottingham said that unemployed people today were worse off in real value, than they were in the 1970's. "For a single person in 1971, the benefit that they were receiving was worth 21% of average earnings. In April 2009 it was worth 11%". With Job Seekers Allowance paying £52 a week, this is why people are looking for work. But where are the jobs? The Post article is about numbers of vacancies at Job Centre Plus offices, and the numbers of people actively seeking work. To put this in context, it should be noted that vacancies on the Job Centre database is about one third of current vacancies (so we're told). 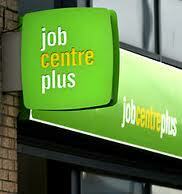 Even so, the Job Centre comparison is valid to getting an overall picture of the jobs position in Nottingham. The national picture is that for every job advertised in the Job Centre, there are 6 unemployed people looking for work. In Nottingham, the average across the City is 9.5 people, which when compared to last years figures (4.8 people) shows that Nottingham's job market has deteriorated faster than places such as Birmingham, Sheffield and Liverpool. It is also currently considerably higher than Newcastle, Bristol, Leeds and Manchester. The average figure in Nottingham is high mainly due to the figures for Nottingham North (27.9 people for every vacancy, compared to 11.8 last year), and Gedling (19.1 people for every vacancy, compared to 6.5 last year). Amber Valley and Bassetlaw are the only two areas out of 13 districts that have shown an improvement on last year. As the Post says, "There are a number of possible reasons why some areas have more unemployed people per job vacancy than others". Low skills and lack of qualifications, the collapse of public sector jobs, as well as a lack of vacancies at big companies and in the construction sector are some of the reasons put forward. Almost 25% of residents in Nottingham North have no qualifications, and lower skilled jobs are often the first to go in a recession. The area also has a much higher than average proportion of the population claiming Incapacity Benefit, some of whom have been transferred to Job Seekers Allowance following Government reassessments. Some single parents have also been transferred from lone parent payments to Job Seekers Allowance. All of these reassessments contribute to higher levels of people now claiming Job Seekers Allowance. Gedling is another good example of how to interpret some of the figures. The number of people claiming Job Seekers Allowance has only risen by about 300, but the number of Job Centre vacancies has dropped by more than 50%. The ending of the Future Jobs Fund has affected figures throughout the country, even though this Fund only created temporary jobs. This will be replaced by the Work Programme, but as this seems to be payment by results, organisations taking part in it will probably not gamble on those who have been out of work for a long time, but focus on those that may seem to be a safer bet to get into work. Another of the problems, particularly in the public sector, is that employers such as the borough and county councils, police and fire service have a recruitment freeze on to save money. Let's take a closer look at the figures. According to the Post, in May 2010 there were 2,384 unfilled positions at Job Centres across the City, compared to 1,379 in May 2011. On the surface this looks good. However, the number of people claiming Job Seekers Allowance has also increased by more than 1,200 people over the year, bringing the total across the City to more than 13,000 in May 2011. Even if it's true that Job Centres deal with about one third of the vacancies, we still have 1,379 x 3 = 4,137 vacancies, with 13,000 people actively seeking work. I agree with Nottingham North MP Graham Allen when he says, "These figures are both shocking and damning in equal amounts". He is also right to say that for each person competing for the vacancy, there is a whole family that will be struggling to just get by. It is easy to lose sight of the fact that behind every statistic, there is a human being. For every one person who misuses the system, there are thousands who simply want to get a job, to earn money, and have the freedom that this brings. It is typical Government action, when to deal with corruption by the few, they punish the innocent majority, instead of going after the few. The Post highlighted the stories of three people in their search for work. All were qualified in one way or the other; hairdressing, childcare and libraries. All send off about 20 applications a week, for any job going, and all say that they never hear anything back, not even a rejection note. As one said, "It makes you feel like giving up and just forgetting about it, but we won't do it, we can't do that, but it's very frustrating". Well done to her for that attitude. This highlights one of my grievances. I was involved in recruitment for many years, and though it costs money and time, the one thing that I always insisted on is that every one who applied for a job, should get a reply. It's how I would want to be treated, so that's how we should treat others. Not to do so is disgusting and unprofessional, even if it is standard practice. The Government are getting rid of Local Development Agencies, which is not a good sign for future prosperity, even if they are replacing them with something else. Here's another example of throwing out the baby with the bathwater. Some LDA's have not worked, but Nottinghamshire's has, so why get rid of the successful ones along with the failed ones? This drives me mad. The future doesn't look great for jobs, but I hope I'm wrong. Through no fault of their own, thousands of people in the City of Nottingham are without work and receiving Benefits. This is the reality for Government to understand, and to ensure that unemployment benefit is at a level that people can live with. Stop demonising all unemployed people; the vast majority want to work, but where are the jobs?